Award-winning photographer Roger Wade takes you on an intimate tour of more than two-dozen exquisite top-end log and timber frame homes (Town + Country Cedar Homes…). Over 350 color images provide stunning details and sweeping overviews of these impressive residences, individually crafted from beautiful White Cedar. Explore dozens of private kitchens and baths. Marvel at the great rooms, soaring ceilings, and enormous fireplaces. Gather decorating ideas for every room, from master suites to home offices and entertainment rooms. Study architectural profiles set amidst idealistic landscapes, and picture yourself retiring to their sweeping decks and sheltered porches. In addition to the beautiful imagery, each home is shown with floor plans that will help you design the home of your dreams. Roger Wade … Tina Skinner is a professional writer and editor specializing in design. 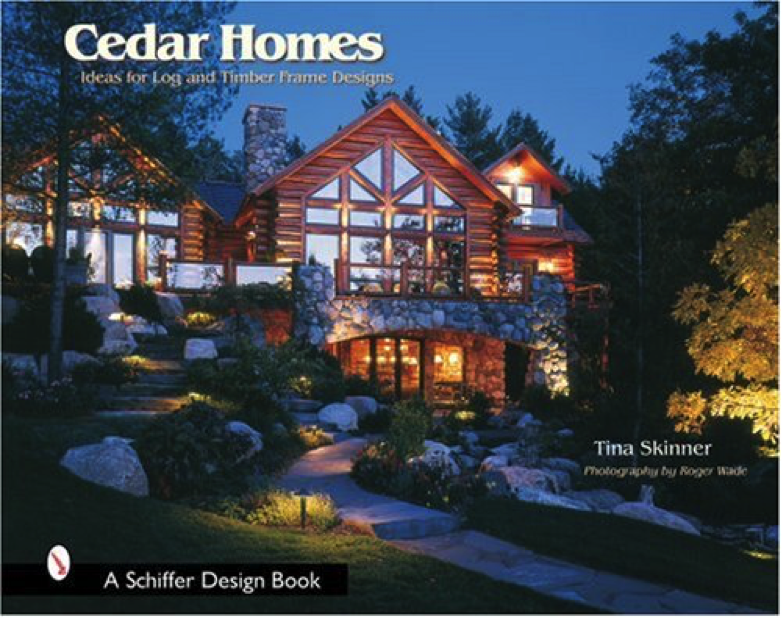 This book, and its sibling CEDAR STYLE, were mainstays for log home and timber home clients before the digital photo revolution. Every client had dog-eared pages or post-it-notes highlighted photos of favorite log home exteriors, log home kitchens and baths, gable glass configurations, fireplaces……..ah, memories.